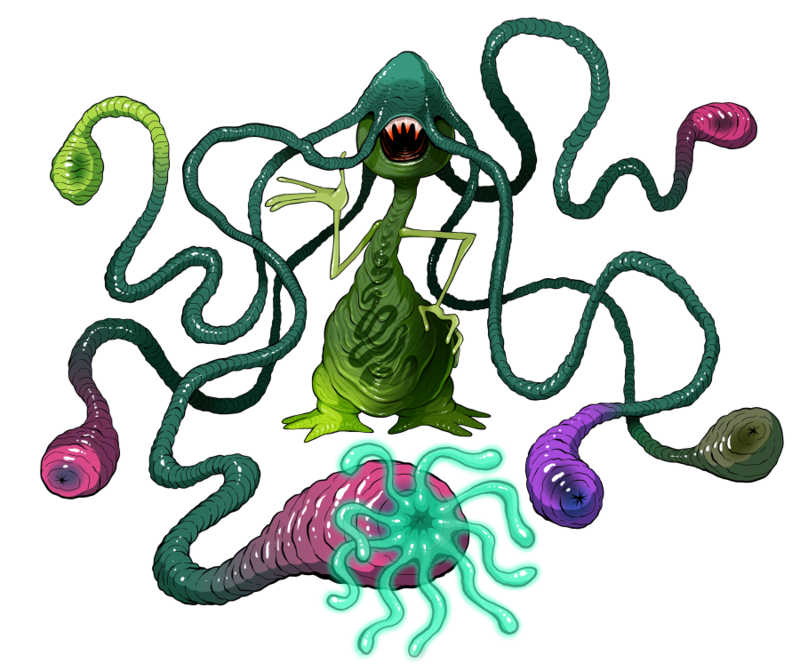 The Painstem is a largely sessile creature whose long, roving stalks bear a variety of debilitating and deadly weapons. Capable of only a ponderous shuffling, this hominoid dislikes traveling for even short distances and seldom finds it necessary, standing still for even years at a time while its six cranial stalks, guided by their own ganglial clusters, quest for prey with or without the creature's conscious input. Smaller prey is swallowed and digested whole by the appendages themselves, while larger quarry is dragged to the central body where the creature clamps tight to its captive with one massive, four-pronged tooth and shreds through flesh with a powerful radula, guzzling pulverized tissues and fluids down its jawless, sucking throat. Traditional Painstem stalks terminate in a retractable bundle of luminous, sticky tentacles, administering a chemical secretion that causes excruciating pain followed by fatigue and numbness. Over the centuries, Painstem have been modified with a number of other, more specialized weapons, and most specimens can grow any combination of preferred appendages as they please. With their independent nervous and digestive systems, these stalks can even survive almost indefinitely once severed from the creature, fusing their remaining stem to the nearest surface and preying on whatever small organisms come within reach. Particularly territorial Painstem may build and maintain an entire "garden" of such stalks, requiring only a few days to regenerate each lost portion. The Painstem's largely boneless torso can stretch for several times its length to further facilitate feeding, and its highly adhesive feet can keep it planted firmly in place as it grapples even significantly larger monsters. A Painstem is self-fertilizing, and can develop an infant budling within the terminal bulb of a preferred stalk roughly every ten years. This stalk is typically detached and left to its own devices for the ensuing ten months of gestation, and neither parent nor child display any particular attachment towards one another. Regardless, the creatures are communal by sheer laziness, and typically form "fields" of related individuals standing only far enough apart that their stalks don't entangle. The Painstem is not bright and exhibits very little emotion, interested primarily in either resting or finding an ideal resting location. It does, however, typically take pride in the beauty of its colorful tentacles, and almost any given specimen is quite convinced that it possesses the loveliest tentacles of all its kind. It is consequently vulnerable to flattery and easily distracted by tentacle-centric conversation, but casually disregards any negative remarks as signs of "jealousy." Both Painstem and their severed, living tentacles enjoy steady popularity as decorative defensive systems, with some enterprising Painstem selling or trading their own carefully cultivated stalks themselves - always boasting that theirs are of particularly superior quality, of course. On the active battlefield, a Painstem may be dropped in a strategic location, mounted to another monster, or its stalks alone distributed as emergency weapons among its allies. Standing one atop a simple, wheeled platform is not uncommon, but the creature may complain excessively of motion sickness and quickly abandon its vehicle. Its apparent comfort being carried by another creature belies the truth that it merely finds the former technique too unbecoming. STICKY FEET: the Painsteam can adhere to any surface it stands upon and is extremely difficult to move by force. SUCKERMAW: the monster's mouth holds fast to its prey, and almost cannot be removed without causing significant injury to the victim. 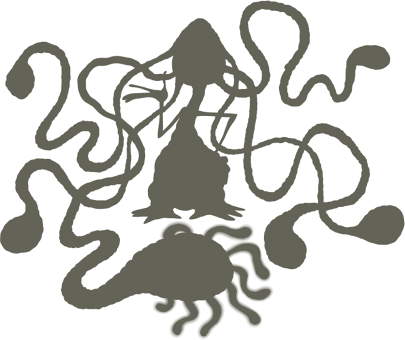 COMBAT STALKS: the monster's tentacular stalks can stretch to considerable lengths and engage foes on their own. They may also be detached from the creature and "planted" in place. STINGER: still the most common and the monster's original namesake, the stinger stalk carries an anemone-like array of luminescent tendrils. Chemical secretions causes debilitating pain on contact, which gives way to numbness. ZAPPER: characterized by a bundle of long, thin, wormlike filaments. Delivers a paralyzing electrical shock. SIZZLER: a set of three chitinous, segmented "fingers" secrete a chemical concoction that heats rapidly on contact with air, their tips glowing hot within seconds. CORRODER: four large, fleshy petals exude a thin slime which slowly dissolves flesh and more rapidly disintegrates metallic substances. RASPER: the rasper stalk opens into a powerful sucker ringed with fine teeth, its grip almost unbreakable as it gnaws at flesh and bone. SNAPPER: the tentacle houses a scissorlike "beak" with razor sharp edges. Relatively rare, Painstem prefer their other weapons to such brutality and seldom grow more than a single snapper stalk at a time. CRUNCHER: a thicker, blunter variation of the snapper stalk, possessing tremendous crushing strength. RIPPER: another variant upon the snapper, with a ring of wicked hooks. Abhorred by all but the most bloodthirsty and deviant Painstem.